At any time of the year, Queenstown is a class act for nature-based adventures, awesome alpine scenery and blissful food experiences. Loved by filmmakers, revered by global adventurers and worshipped by scenery-seekers, Queenstown is definitely somewhere to get excited about. Wherever you stay in this alpine nirvana, you'll find yourself surrounded by the larger-than-life peaks, lakes, rivers and glacier-carved valleys. The vertical ruggedness of this region contrasts beautifully with the indulgent lifestyle you can enjoy while you're here. Air New Zealand offers non-stop international flights from Brisbane, Sydney and Melbourne, as well as non-stop domestic flights from Auckland, Wellington and Christchurch, and direct flights from other main New Zealand centres. With all our domestic airfares you can choose seat, seat+bag, flexitime or flexidate fare types. 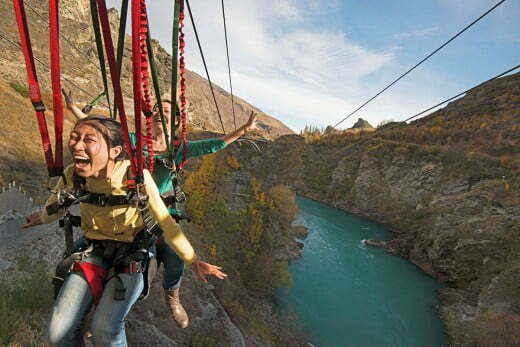 Queenstown's thrills are legendary. At the extreme end of the spectrum there are bungy jumps and canyon swings. Milder jolts of adrenalin are provided by jet boats, luge rides and helicopter picnics. 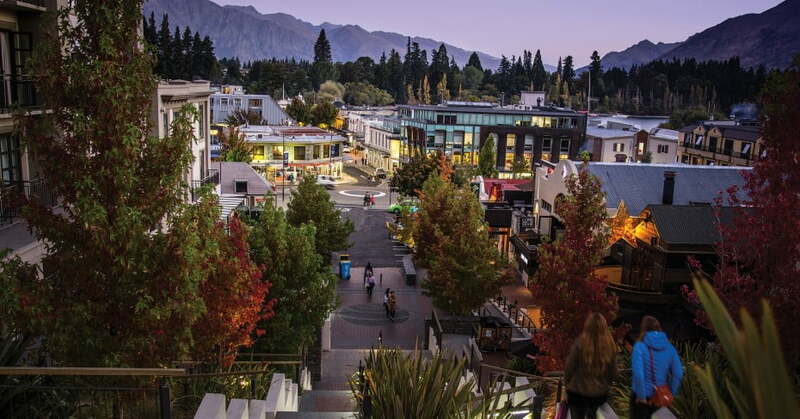 At any time of the year, Queenstown has something for everyone. In winter there's a huge range of activities on and off the slopes. In spring the days are longer and warmer, so you can carve fresh tracks in the morning and play a round of golf or find an adrenaline thrill in the afternoon. In summer, the landscape welcomes all kinds of adventures, from mountain hikes and river rafting to lake sailing and kayaking. Autumn is the perfect season to enjoy Queenstown's world class wine, food, shopping and wellness experiences, surrounded by vibrant seasonal colours. Queenstown makes it easy to relax and dive right into nature. Whether you choose a leisurely lake cruise on the TSS Earnslaw, wine touring in Gibbston or a flightseeing trip to discover fiords and snowy mountains, you can count on inspiring landscapes at every turn and a fun-filled town for socialising at the end of each day. If you're craving a certain level of luxury for your holiday, Queenstown has some extraordinary boutique lodges and five-star hotels. You'll enjoy the highest standard of accommodation, plus the chance to dabble in guided fly fishing, river kayaking, horse-riding and mountaineering. And every day there are award-winning restaurants to try, as well as cosy bars with roaring open fires. For travel ambitions that are more down to earth, this alpine town has many options for modest budgets. There are campsites, hostels and budget hotels, as well as cheap-and-cheerful eateries. Fergburger, Joe's Garage, Taco Medic and Madam Woo are proof that fantastic food can also be inexpensive. There are also plenty of low-cost activities in Queenstown, such as biking sections of the 122km Queenstown Trail and hiking the hills. Try gold panning in Arrowtown and you might go home richer! Nestled in a bay on Lake Wakatipu, Queenstown is dwarfed by the surrounding mountains. On the peninsula across the bay, Queenstown Gardens offer relaxing walks through plantings of native and exotic trees. 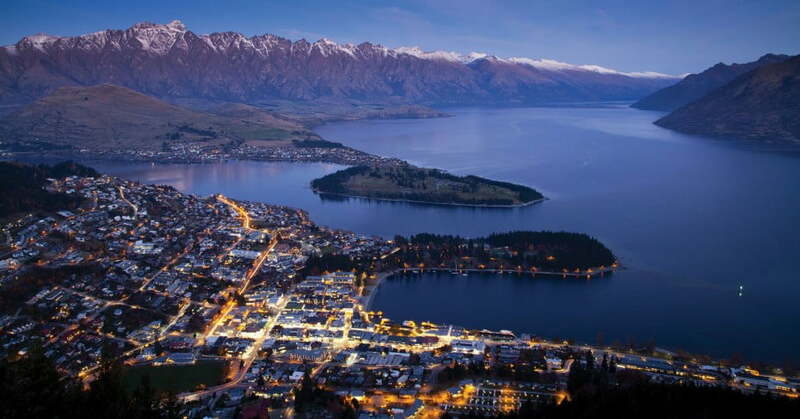 From there, views extend back over the town to the Skyline Gondola that runs up Bob's Peak and across the lake to the well-named Remarkables mountain range. If you saw the Lord of the Rings movie trilogy, you can discover some of the filming locations in and around Queenstown. From the village of Glenorchy you can see Mount Earnslaw, which represented the Misty Mountains in the movies. Here you can also discover Lothlorien, represented by the beech forest on the road to Paradise. And at Arrowtown you can walk to the Ford of Bruinen on the Arrow River. A stand-out scenic experience is the precipitous road into Skippers Canyon, which is best explored on a 4WD tour with a local guide. It crosses a 100-metre historic suspension bridge and crawls around canyon cliffs to Mount Aurum Recreation Reserve, where you can enjoy 9100 hectares of dramatic landscapes managed by the New Zealand Department of Conservation. Queenstown's thrills are legendary. Catch a helicopter to a picnic lunch high on an alpine ridge, with the option to mountain bike down; jump into a jet boat and zoom into river gorges that once yielded gold; go tandem skydiving above the lake; or saddle up a horse to explore the back country. The entertainment possibilities just keep coming. For keen anglers, the streams, rivers and lakes of Queenstown are home to trout and salmon. Or you can visit Walter Peak Station, a pioneering New Zealand sheep farm, for lunch and a farm tour. Scenic flights can put the mountains at your wing tip or connect with boat trips in remote fiords. And in winter there are four ski areas within 90 minutes' drive of town, offering varied terrain for all abilities. Golf? You bet. Queenstown and neighbouring Arrowtown have six courses between them, including spectacular Jack's Point. Carefully designed to follow the landscape, this championship golf course was created with minimal excavation to provide an unbeatable combination of exciting fairway challenges and breathtaking natural beauty. You may find yourself reaching for your camera more often than your putter. Another internationally recognised ‘must-play' golfing destination is Millbrook Resort. Set on 500 acres beneath the Southern Alps, it includes five-star accommodation, fine dining and an award-winning day spa. You might never want to leave. March is time for the MacPac Motutapu Race, an off-road sporting event for walkers, runners, triathletes and mountain bikers. Even if you're not likely to turn in a competitive time, it's worth doing this event just for the scenery. The marathon run and walk follows a route early Maori used for hunting and gathering through the Motatapu, Soho and Glencoe Stations, which are opened to the public once a year for this event. Towards the end of April, the historic gold mining village of Arrowtown celebrates its seasonal colours with the Akarua Arrowtown Autumn Festival. The fun includes workshops, an art exhibition, photo competition, gold panning championships, duck race and dog shows. A parade and market day is the highlight of the festival. LUMA, at the start of June, is when Queenstown turns on the lights in a brilliantly arty kind of way. It features illuminated art and sculptures along the lakefront and through Queenstown Gardens. Later in June Queenstown pulls on its best winter clothes, turns up the music and shows the world how to have fun. The Real Journeys Queenstown Winter Festival promises you some of the coolest days in New Zealand. It's all about laughs and frivolity, music and creativity, food and wine, sport and spectacular feats. October is jazz time. Held over Labour Weekend, the Queenstown Jazzfest attracts some of the best national and international musicians for a programme of traditional and contemporary jazz. Many of the gigs are held at the Queenstown Memorial Centre; Arrowtown also gets a look in with the Arrowtown Day of Jazz. In mid-November, Air New Zealand Queenstown Marathon fever is running hot – there are four distances to choose from, from 3km to the full 42.2km. 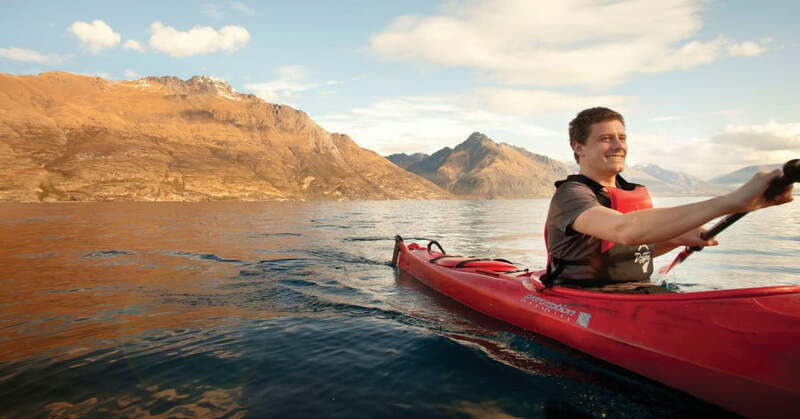 Queenstown was the birthplace of New Zealand adventure tourism. Whether you raft down the Shotover River or paraglide off Bob's Peak, the thrills are as massive as the mountains. There are four ski fields in the region, offering exciting terrain for skiers and boarders. The closest, Coronet Peak, is just 20 minutes from downtown Queenstown. Two wheels are better than four if you want to immerse yourself in the Queenstown landscape. Discover the hiking trails up Queenstown Hill, around Moke Lake or along the shoreline of Lake Wakatipu. In summer aim higher and head up to Lake Alta from the Remarkables ski carpark. Golf is a hugely scenic experience in Queenstown, especially if you tee off at The Hills, Millbrook, Jack's Point or Kelvin Heights. For a night of edible splendour, book a table at Amisfield, Roaring Megs, Rata or The Grille by Eichardt's. Your camera won't get a moment's peace, because Queenstown is surrounded by some of the world's most photogenic mountains. With or without snow, they are magical. Bungy jumping was born in Queenstown and the most famous leap of all is off the historic Kawarau Bridge. Get up close and personal with the boulders and sheer rock walls of the Shotover River on an exhilarating jet boat ride. See the grandeur of the Southern Alps and Fiordland from the air on a fixed-wing or helicopter flightseeing adventure. If you're interested in cheap fares to Queenstown, we run regular special offers. You can sign up for low fare alerts to receive early notice of these offers. You can also sign up to receive regular email updates about cheap airfares, packages, competitions and exclusive offers. Queenstown is wonderful at any time of the year. Choose winter if you love snow sports, autumn for its colour show, spring for freshness (and still some snow action!) and summer for golden weather. The average high in summer is 22°C; the average winter high is 9°C, however temperatures can drop as low as -2°C. If you're visiting Queenstown from overseas you might need a visa to holiday in New Zealand, depending on where you're from and how long you're staying. See the visa-waiver list. See the visa-waiver list.